Register by clicking the green TAKE FREE QUIZ button, or if you prefer, click the blue ENTER WITH FACEBOOK button. 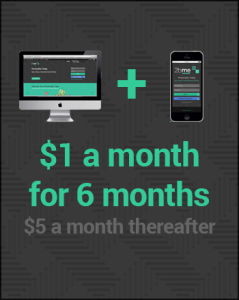 There is a free 30-day free trial period and no payment information is required to begin the trial. Click the image that best fits you (or the person you are pretending to be) to start the interactive four-choice personality quiz. The choices are based on Carl Jung’s theory of psychological types. Jung’s pioneering work was later popularized by the late mother-daughter team of Isabel Myers and Katharine Cook Briggs (creators of the Myers-Briggs), and psychologist David Keirsey (author of Please Understand Me). The quiz takes less than a minute to complete. When you’ve made your last choice, you will be able to review your results and decide if they are a good fit for you. If not, take the quiz again. It changes slightly each time. Most people have consistent, clear preferences on two or more of the four options. Don’t be discouraged if you tend to get inconsistent results on one or two options. It just means you are more balanced in this area. And remember that the purpose of psychological assessments is not to pigeonhole people into specific classifications but to increase awareness that there are distinctly different ways to take in information and make decisions and we all have preferences–strong or weak–for one or the other. Click on the “So What?” button to see why personality matters. The resources on the linked page will also help you decide if your quiz results are a good match for you. Note: 2bme has no affiliation with the Myers & Briggs Foundation or its affiliate, Consulting Psychologists Press, Inc., and we do not administer the MBTI® instrument or the Myers-Briggs® assessment. When you research type theory, you will soon become aware of a paradox–It’s embraced by business and government but frowned upon in academia. Taking psychological assessments s is a right of passage in many premier institutions from the State Department to McKinsey & Co. Since 1921 more than 10,000 companies and 200 government agencies in the United States have used type theory to groom leaders and build teams. Today, more than 80 percent of the Fortune 100 use type theory. But despite the far-reaching use of Jung’s type theory in organizations, no major academic journal has published research on it, which academics consider a strong repudiation of the test’s authority. Most of the academic literature today promotes the Five Factor theory represented by the acronym OCEAN–openness, conscientiousness, extroversion, agreeableness and neuroticism. Of the five, we believe only one–neuroticism–does not map closely with Jung’s type theory. Now, try to imagine explaining to your subordinates, bosses, and co-workers why it’s okay to be neurotic! Organizations use type theory, and will continue to use it, because it provides valuable insights into human behavior without judging one type to be better or worse than another. The bottom line is that it works. If it didn’t, the Fortune 100 wouldn’t use it. 2bme uses words and images that are hard to get out of your head once they find their way in. 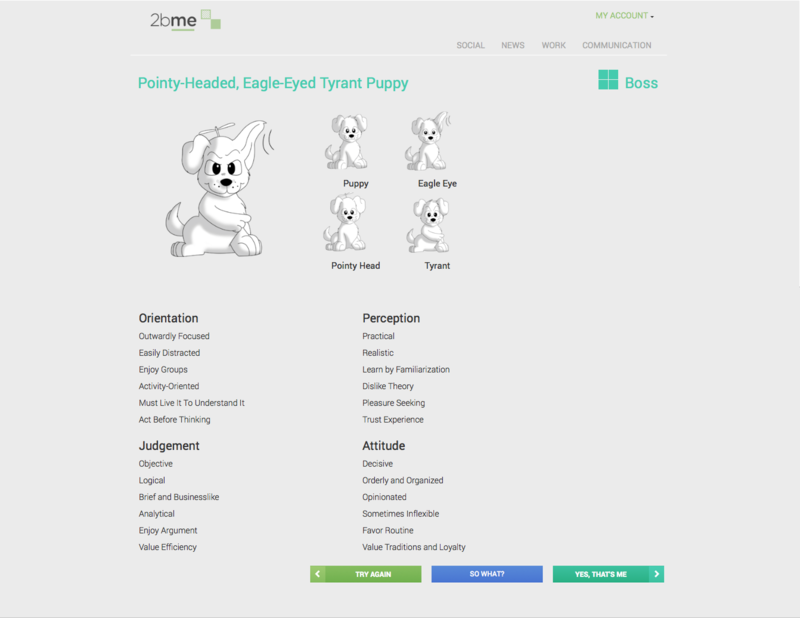 For example, the ESTJ personality type (extroverted-sensing-thinking-judging) becomes a pointy-headed, eagle-eyed tyrant puppy, also known as the Boss, represented by the character above. Once you come to see introverts as turtles and extroverts as puppies, you will start to see turtles and puppies all around you. And that is the point. Like learning to play a musical instrument, learning to work with personality requires learning a new language. 2bme makes that language much easier to learn, remember, and use in action. As the saying goes, pictures are worth a thousand words. And whimsical, tongue-in-cheek humor is easier to remember than technical jargon. The four-choice personality quiz takes less than a minute to complete. By contrast, typical psychological assessments include roughly 100 largely redundant forced-choice questions and take 30 minutes to complete. Whereas taking the MBTI is an event, taking the 2bme quiz is a casual experience that can be repeated often for added clarification and insight. If you don’t like your theme or if you are curious about the themes for other personality types, click on My Account | Themes in the header. There are male and female versions for each of the 16 personality types. While you are checking out available themes, complete your profile with location and time zone details. This will set the clock and local weather widgets in the header bar. The Site uses application program interfaces (APIs) provided by several popular web apps to enable users to access multiple apps from a single screen. There are four categories of APIs–Social, News, Work, and Communications. Each category has five APIs for a total of 20. Once your accounts are connected, you can review content from multiple accounts on a single screen without the need to switch between apps. Learning to work with personality is much like learning to play a musical instrument. It requires both an understanding of theory and daily practice over long periods of time. One cannot master the guitar in a month, much less in a one-day workshop. Millions of people have taken psychological type assessments. But sadly, most people cannot recall their personality type or anything significant they learned about themselves or others a few months later. The initial experience is forgotten, and without practice there is no hope of mastery. We designed 2bme to make it easy and fun to master the art and science of working with type theory. Business owners and managers have the motivation to learn about personality–boosting individual and team performance–but they don’t have spare time to spend attending training seminars and reading books. Employees are also busy and they don’t have a profit motive at stake. For type assessments and training to have lasting effect in building better teams, managers and employees alike must learn to speak the language of type theory and practice each day–no more than a minute or so. Each day a scrolling ticker in the web utility footer (just below the personal photos that appear when you register your Facebook or Instagram account) provides a personality attribute along with a popular quote. The ticker also announces recent “briefs” that look into personality in greater detail. For those who don’t spend time at a desktop computer, the website is accessible by phone. We also have the world’s only 60-second pocket personality quiz because personality isn’t just personal, it’s social. View your profile and retake the quiz any time by clicking on the four-square icon just above the ticker. Before your free trial expires, enter coupon code 2bme-6-4-1 at checkout to get six months of Personality Today for only $1 per month. To subscribe, login to 2bme and then click here. We hope you enjoy the 2bme experience, and please let us know how we can make it better. Cheers!